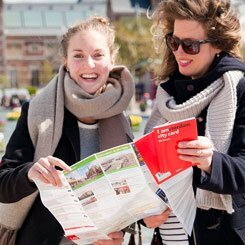 If you're wondering what to do in Amsterdam when you're visiting, then this page shows both some popular options and a number of hidden gems - the Amsterdam sights and activities that we particularly like ourselves. If you like bars and night clubs, then one way to find out what to do in Amsterdam is strolling the Leideseplein or Rembrandtplein squares, Amsterdam's two main venues for going out. At almost each time of the day and night, these squares are bustling with the party crowd. 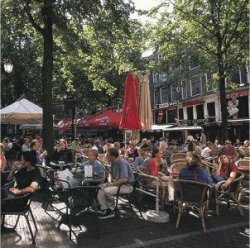 Especially at the Rembrandtplein, most bars have terraces overlooking the squares, which are perfect for sun-lit days. They are rather touristy, but still recommendable. 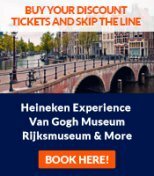 If you love art and culture, then you'll find three leading Amsterdam museums (the Rijksmuseum, Van Gogh Museum and the Stedelijk, which is now closed for renovation) plus the Concertgebouw conveniently next to each other at the Museumplein square. The area has many cosy cafes and stylish restaurants, perfect for culturally minded people. Like the infamous Red Light District, these areas are bustling with things to do for those who have come for the more obvious thrills Amsterdam has to offer. Ours is a city of hidden marvels however, and many people wish to know what to do in Amsterdam apart from the city's better known offerings. If you're looking for a lunch in Amsterdam with a difference, one option is to take a hike to the very top of luxury department store Metz & Co. Situated on the shopping street of Leidsestraat, Metz & Co. is perfect for a spot of retail therapy, and the café on the top floor offers an unrivalled view of the city as well as a tasty place to grab a bite. Want to know what to do in Amsterdam to quench a thirst? The city has numerous brown cafes that serve local and Belgian beers in comfortable, relaxed surroundings such as De Zotte at Ramstraat 29, just a short walk from Leidseplein, or In 't Aepjen close to the city centre at Zeedijk 1. For a real taste of Amsterdam, however, you need to visit one of the city's tasting houses (proeflokalen). Here you can drink Dutch Jenever, or "young gin"; remember to take the first sip from the glass while it's still sitting on the table, as is traditional. Proeflokaal Wynand Fockink, tucked away beside the Krasnapolsky Hotel on Dam Square is a great choice, just be sure to get there early as Amsterdam tasting houses do not stay open late. So, you've seen all of the Van Gogh you can find, admired the great works of the past in the Rijksmuseum and been moved by the tragic history of the Anne Frank Huis. Still want to keep learning but don't know what to do in Amsterdam once the big three have been done? Why not check out the tools of a less enlightened past in the Torture Museum at Singel 449, or visit the Museum of Bags and Purses at Herengracht 573 for a more stylish experience. The Tulip Museum at Prinsengracht 112, and the Houseboat Museum, further along at Prinsengracht 296 round off the selection and mean you need never wonder what to do in Amsterdam to reward your brain again. There's a lot to do in this city, and those willing to scratch the surface are guaranteed to find a wealth of hidden gems to write home about. Every Sunday at Spui, the small square in the city centre by the famous Begijnhof, you can find a selection of local and international artists exhibiting their work for sale. Ever wondered how to make sure you have a unique souvenir? Well this is your chance to take home an original piece of Amsterdam art. Right in the midst of Amsterdam's seedier side, the Red Light District, you might be surprised to stumble across one of the city's best hidden gems, the Fo Guang Shan He Hua Temple. This, the largest traditional style Buddhist temple in Europe, sits right on the edge of the Red Light District and Amsterdam's China Town on the Zeedijk. Respectful visitors are welcome, as is photography, but the curators do ask you to refrain from taking video images. One great way to find out what to do in Amsterdam on any given date is to read the free magazines distributed in cafes and fashion stores. Uitkrant, NL20 and others can all be found throughout the city and have listings of gigs, theatre events and festivals as well as reviews and interviews. Some magazines are in Dutch, but others catering to the tourist trade can be found in English, such as the Tourist Board's Day by Day and Timeout Amsterdam.